Chromebooks have come a long way from the dark, buggy days of the CR-48 and laggardly Intel Atom processors. Back when Chrome OS really was just a browser, it was fairly easy to write off as just another strange Google experiment, unlikely to succeed and conceptually far ahead of its time. Who could get by on a laptop with just the web? I, like many people, thought Chromebooks wouldn't appeal to anyone. But 7 years after the first Chromebook, Google's browser-based OS is still with us. And, much to everyone's surprise, it's going stronger than ever. The reason for that, primarily, is the browser-focused laptops turned out to be ideal terminals for students accessing web applications. (It helped that they are also very affordable and easy to administer.) Chromebooks are now far and away the most popular laptops in schools in the US, and that means Chromebooks will, very likely, become very popular with a new generation of consumers who grew up using them. While you may not see many Chromebooks at your local coffee shop, step into a classroom and it's exceedingly likely you'll find dozens of them. Personally, I do like Chromebooks. They have their [very noticeable] limitations, but they're still brilliant machines when they're doing what they were built to do. Chromebooks even have a real fanbase, and that fanbase has been asking Google to build a new "premium" Chromebook since the second-generation Chromebook Pixel debuted well over two years ago. Enter the Pixelbook. At $1000 minimum, there's no question that Google wants the Pixelbook to be perceived as a top-tier product. It's the most expensive Chromebook on sale today by far, and can be configured all the way up to an eye-watering $1650 for the Core i7 model with an ultra-fast 512GB NVMe SSD and 16GB of RAM. I'm testing what will likely be the least popular configuration, the Core i5 with 256GB of storage. I say this because it has the same amount of RAM and same CPU as the 128GB model - you're just paying for more storage, and who really wants 256GB of storage on a Chromebook if it means $200 extra? Anyway, that's really neither here nor there - what you should know is that all three trims are functionally very similar. Meaning most people will probably get the cheap one. Oh, there's a pen, too. You have to buy it separately and it costs $100. I genuinely don't believe it's worth it unless you know to a certainty that you want to do a lot of stylus work, and that's going to be a personal question. I don't think Google's stylus support on Chrome OS is especially amazing or that the Pixelbook's Pen has particularly great latency or "feel." It's just... fine. But overall, I quite like the Pixelbook, and I've been using it as my primary laptop for almost two weeks. The battery life is great, it's fast, the display is very nice, it looks super clean, the keyboard is great, and the trackpad is nice and big. 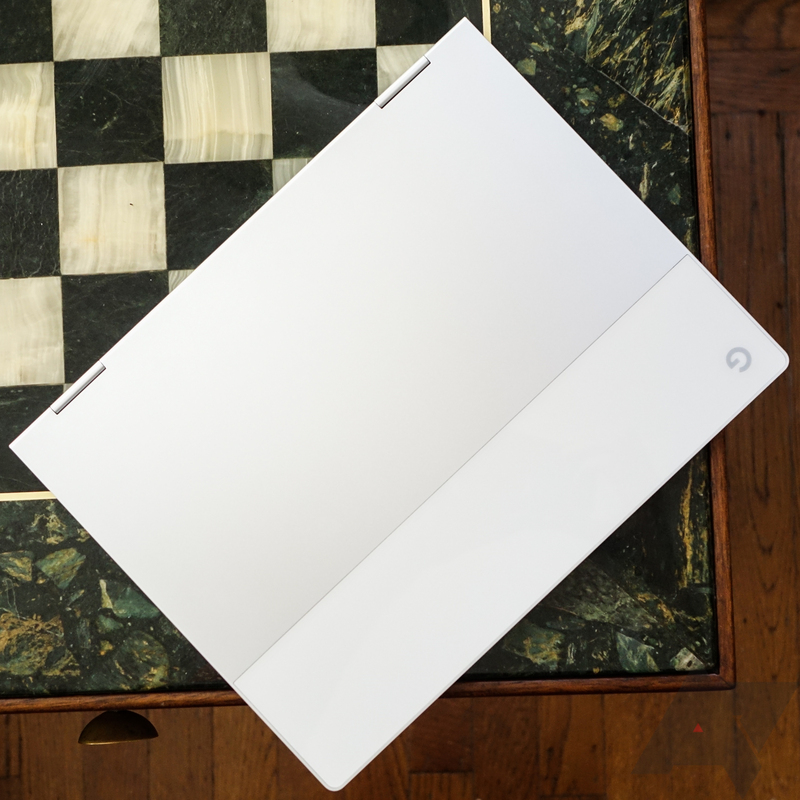 This is, without question, the best Chromebook you can buy. It feels like a $1000 laptop. But there's a bigger, more important question to answer here: is there $1000 of Chrome OS inside the Pixelbook? I think, for most people, the answer is still probably "no." 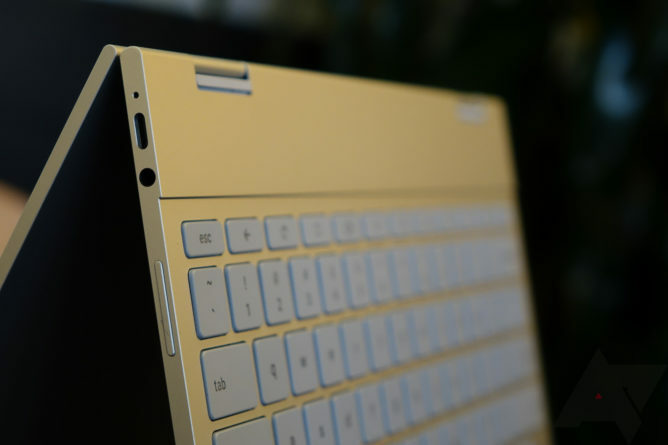 Keyboard and trackpad I really enjoy the Pixelbook's keyboard - it has a good balance of firmness and feedback. The trackpad is big and works well. Battery life Google quotes up to 10 hours, and I think with a little brightness and load management, it's pretty easy to get close to that number. It also charges really quickly. Quality The Pixelbook feels like a $1000 laptop. It is solid and seems well put together. In tablet mode, it feels like one piece, not a tablet with a laptop hanging off the back. Fast This is the fastest Chromebook you can buy today. It's pretty quick, even this base i5 model (though even the i7 model is still dual-core, it's just clocked faster). Storage A Chromebook with Actual Storage! The Pixelbook starts at 128GB of internal storage, increasingly necessary with the proliferation of Android apps on Chrome OS. Pen At $100 and with few 3rd-party applications optimized for it, it feels like an afterthought. Even in Google's suggested demo apps, the latency just feels very average. There's also nowhere to put it in or on the Pixelbook. Tablet mode The Pixelbook is way too big and heavy to use as a handheld tablet. I like the thought that went into the convertible aspect, but I see myself using the tablet mode basically never. Ports You get two USB-C 3.1 ports and a headphone jack. That's it. Dongles. Dongles everywhere. Bezels The Pixelbook is not a masterclass in efficient use of space. I would have preferred more screen in a package this large. There's certainly room for it. Chrome OS Chrome OS has its limits. If you need your laptop to run a specific application or complete a specific task, a Chromebook may just not get you there, even as far as it's come in seven years. The Pixelbook is probably going to be a bit polarizing. Its white-on-silver color scheme is not my favorite, but I've grown accustomed to it enough that I no longer find it unattractive so much as I do a little sterile. That said, I really like the rest of the laptop in an aesthetic sense. 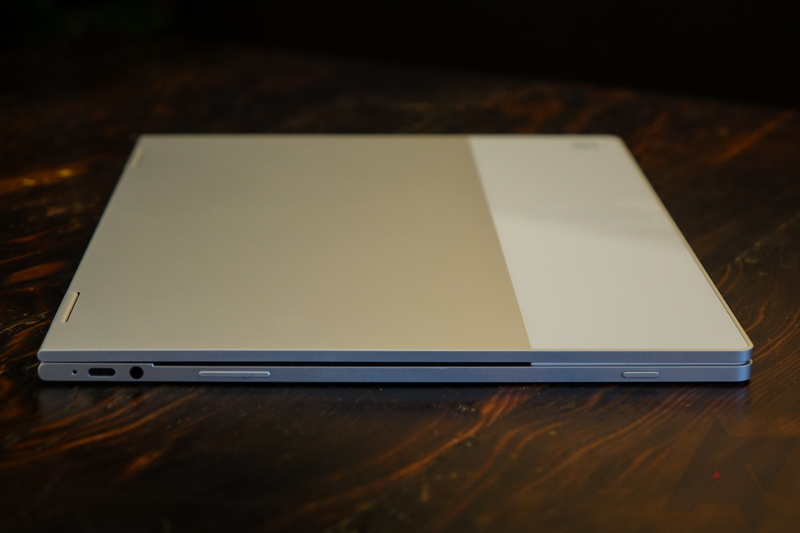 The Pixelbook is extremely clean looking, the aluminum upper, lower, and hinges all look finely crafted and free of fussy, unnecessary elements or flourishes. If I could describe the Pixelbook in a word, it would be "IKEA." This is the laptop IKEA would design. It's playful, but very stark and unadorned. Some people will probably not like this, saying things like "it looks like a toy" or "there's so much wasted space." And it's true: the Pixelbook does look a bit toy-ish. No one is going to confuse this for a Macbook or a Surface. It is distinctly Google in a way I don't even think the Pixel phones are. The glass panel on the lid and tightly rounded, square corners almost make it look like a caricature of a laptop. Laptops don't look like this, unless you were to imagine a generic laptop that you'd find in a clipart library or something. The Pixelbook looks vaguely... not real, if that makes any sense. It's part of the charm of the thing, and while I would appreciate a version that adopts the "Quite black" color scheme of last year's Pixel phones, I think it would also lose a lot of that charm in the process. It would definitely look sleeker for it, though. One aspect of the design I'm not a fan of are the display bezels: they are far too large. The Pixelbook is already a tall laptop, and the big, chunky bezels just make it more so. I understand that packaging constraints and a desire for thinness in the base of the machine are probably contributing factors. But given my personal laptop is a Dell XPS 13, this feels like a big step back. The Pixelbook is also quite top-heavy, and the screen does jiggle a bit when typing on a flat surface. Using it in your lap can also be trying because of the weight distribution. Physical connectivity is... streamlined: you get a 3.5mm jack and two USB-C 3.1 ports. That's it. The Pixelbook's keyboard, I am very pleased to report, is excellent. While it doesn't provide the slightly unsettling, tight firmness of the scissor keys on the new Macbook Pros, these are among the better laptop keys my fingers have pitter-pattered away on. My typing speed is noticeably better than on my XPS, which has smaller keys with much mushier feedback. Some people probably won't enjoy the minimal travel on the Pixelbook's keys, but I think as keys of this kind go, they're pretty damn good. They're also very quiet, though not silent. 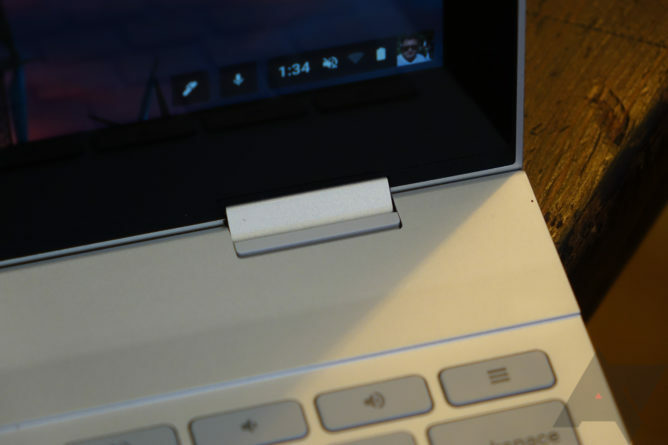 The typing experience is aided by the two large strips of rubber on the base of the Pixelbook that keep it extremely stuck to whatever surface it's sitting on. The base itself also seems exceptionally rigid - it feels like you're typing on a solid block of aluminum. It feels expensive. The trackpad is more of a mixed bag for me. The biggest pro: it's big. Chromebooks often have small trackads, so this is a welcome contrast. It's approaching the size of the trackpad you'd get on a Macbook Air 13, though perhaps a bit shorter. The trackpad extends almost all the way to the bottom edge of the base of the Pixelbook, too, which is definitely nice. The click mechanism is fine, if a little loud. Where I take more issue is in sensing taps. Something I loved about my Macbook Pro, even seven years ago when I last had one, was that I never actually had to click the trackpad. I could do everything by simply tapping on it. Unfortunately, I haven't found the Pixelbook's trackpad reliable enough in its tap detection to forego the use of clicking. It generally works pretty well, but when this is something you're doing constantly throughout the day, even a 95% success rate can feel frustrating. Still, it's much better at this than my XPS 13, which cost nearly twice as much and has a smaller tracking surface, to boot. So, it's probably better at it than most Chromebooks, it's just not perfect yet. As a full "360" convertible, the Pixelbook has been designed with various touch-first uses in mind. 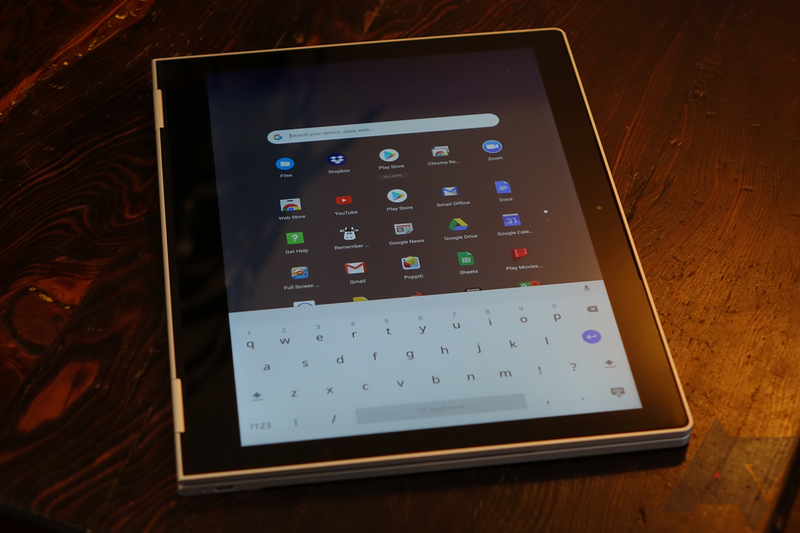 Here's the thing: the Pixelbook is way too damn heavy to use as a tablet unless it's in your lap, or being used in the "tent" configuration. No one is going to carry this thing around and use it like a giant iPad. 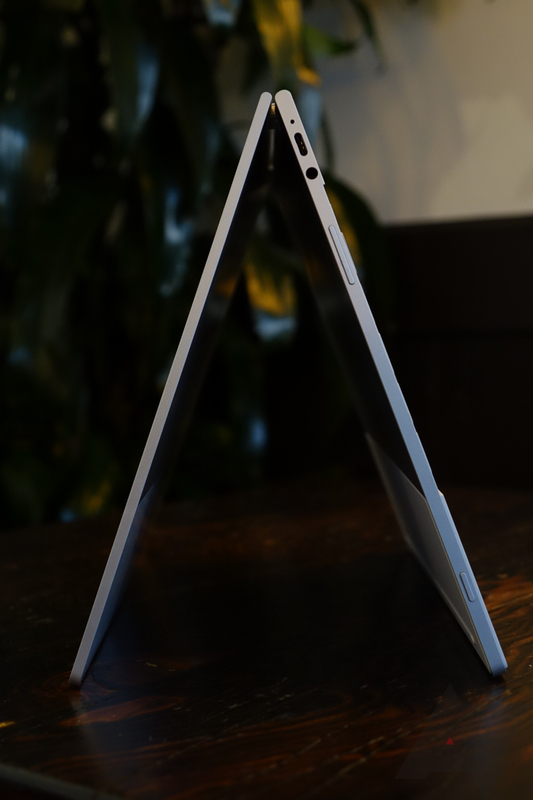 At 2.4lbs, it's the better part of a pound heavier than a 12.9" iPad Pro or Surface Pro 4. That's a lot. And of course it is: it's a laptop with a full keyboard base. I can, of course, see uses for the various positions the Pixelbook can assume. For example, the "tent" mode is great for watching a movie on the plane or when working with the stylus. 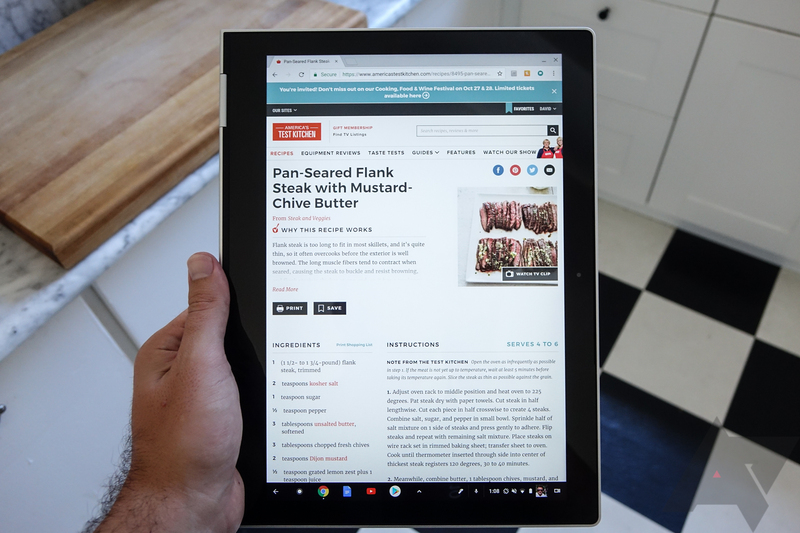 The full "tablet" mode locks into place magnetically with a satisfying thud, and the Pixelbook does really feel like one, solid piece when used this way. As a giant reading device sitting in your lap on the couch or propped up on the knee, it's pretty great! But make no mistake, the Pixelbook is a hefty piece of hardware, even for something a full tenth of an inch thinner than the exceptionally svelte Macbook (which, I should mention, the Pixelbook is 0.4lbs heavier than). I like that Google went the extra mile and engineered a laptop that can take full advantage of its touchscreen by allowing you to position it whichever way you want to best utilize that surface. I do think that, realistically, I will use the Pixelbook in laptop mode almost exclusively. It's just too big and heavy to be something I'd want to use as a tablet. The 12.3" 3:2 2400x1600 display on the Pixelbook is excellent. It gets very bright, colors seem evenly toned, and viewing angles are respectable. Black levels look reasonably good, and I've not noticed any light bleed or strange distortions. Glare on the glossy cover glass isn't terrible, and I think Google did go out of their way to source good components here. This is a very nice screen. Touch input seems very responsive - I have no issues to report. The speakers on the Pixelbook are, predictably, not very powerful. The laptop is so thin that this sort of seemed inevitable. As far as I can tell, they fire out of the display hinges (I'm not sure where else they could even go). The quality is surprisingly decent (good clarity, minimal distortion), but peak volume is not their strong point. Audio from the headphone jack seems good, and I found that output was plenty powerful. Google rates the battery life of the Pixelbook as "up to 10 hours." I'm not going to surprise you when I say Google's figure would probably be difficult to achieve without some fairly aggressive task and display brightness management. However, it's a lot closer to reality than I'd expected. I'd say that, at around 40% brightness, with Wi-Fi on and a half-dozen tabs open, eight to nine hours of runtime has been totally doable for me. Now, what's running in those tabs is going to have a huge impact on the actual battery life you get. Right now, I'm typing this review on the Pixelbook in WordPress, I have Slack open, two Gmail tabs, Google Calendar, and a couple of other less active tabs, and the Pixelbook says I've got 7.5 hours of estimated battery remaining with 70% battery indicated. That's probably a little bit of an overshot, but still: it shows how little power this thing sips when it's not being heavily taxed. Using Chrome's built-in power monitoring (chrome://power), I've found power consumption during my lighter use cases - like writing, checking email, and using Slack - hovers between 5 and 7 watts. That's pretty minimal, and the Pixelbook's 41Whr battery is hardly massive. 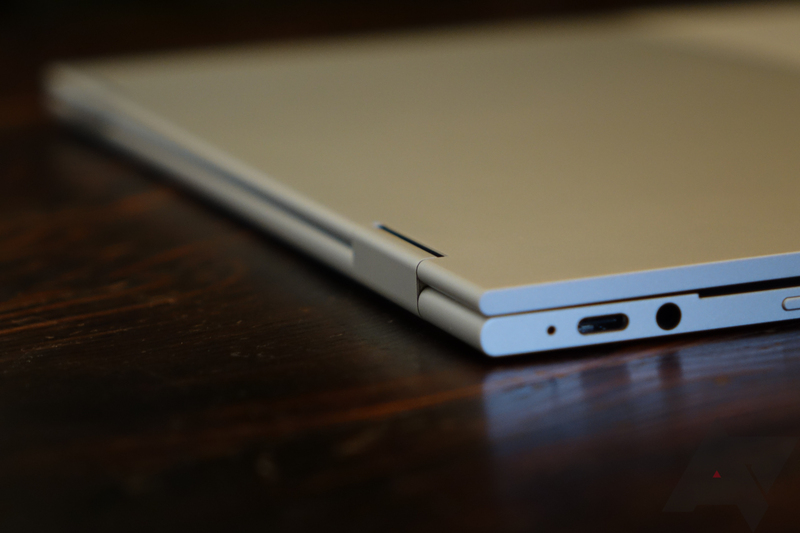 The Pixelbook features USB-C ports for charging on either side of the laptop. Handy. Chrome OS has long been lauded for its power-efficiency, but I find that the most glowing reviews in this regard tend to go to the ARM-powered devices. The fanless Intel i5 dual-core in the Pixelbook is much more powerful than your average Chromebook CPU, achieving a Geekbench single-core score well over 4100 and a multicore score over 7000. The Intel HD 615 graphics are definitely not high-end, but again, still a fair bit more powerful than what you'll find in any other Chromebook. While this is just a gussied-up Core m5 (Intel dropped the "m" naming scheme this year), it's basically similar to what you'll get in Apple's Macbook. If you want to annihilate the battery in short order, just open basically anything that uses GPU acceleration. The Google Maps app brought my estimated remaining time down from eight hours to three. So, for light duty, the Pixelbook's battery life is fantastic, as you'd expect. Under heavier loads like gaming or other GPU/CPU-intensive tasks, your mileage will probably vary considerably. Charging is extremely rapid. Google's 45W adapter can fully charge the Pixelbook in about an hour and a half from empty - this is probably the fastest-charging laptop I've ever used, by a long shot. I was able to nearly top up the Pixelbook from a 50% charge by leaving it on the brick for around 40 minutes, something I'd never dream of with my XPS 13. The included USB-PD brick can also rapid charge smartphones like your Pixel or Pixel 2, so if you're carrying a bag, you only need one charger. Likewise, your Pixel 2 charger can charge the Pixelbook, albeit significantly more slowly. If there's one part of our USB-C future I like, it's this kind of promise. Someday I hope to just have one charger for everything that charges my stuff at exactly its optimum speed. We're slowly getting there. So, we're at the point in this review where you've hopefully learned a lot about the Pixelbook as a laptop - what it does well, how it's packaged, and its general performance characteristics. Now, we get to the stickier bit, and one that I think is also going to be rather personal on some levels. Before we get to the subjective, let's try to be a little objective first. I haven't noticed any major software glitches when using the Pixelbook, Android apps all seem to run fast and smooth, and I've had no problem actually getting apps installed and running. Chrome OS seems rock-solid stable (which is such a dramatic change from the way things were years ago) and the browser is extremely smooth on the Pixelbook. With 8GB of RAM, it should be able to handle a fairly robust tab load without issue. This is easily the most powerful Chromebook you can buy, after all, and it will handle just about anything you can throw at it pretty easily. In terms of capability and features, if you're not familiar with Chrome OS, I'm not about to do a rehash review of the entire operating system here. That's not exactly helpful. 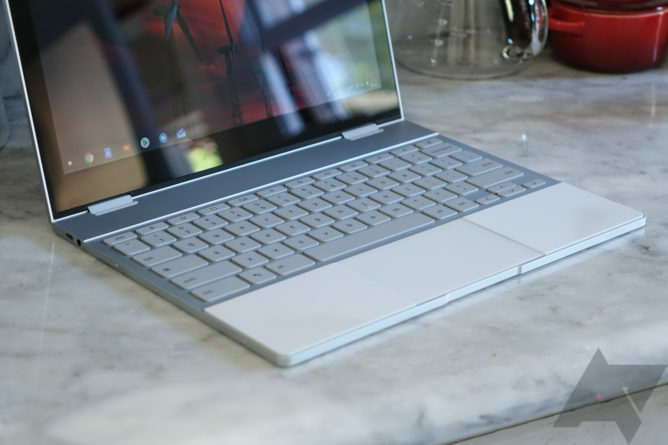 I will, however, give you a bit of a primer if you've not been a Chrome OS user in the past and are curious about the Pixelbook mostly for the fact that it is The Google Laptop. If you're interested in it from that perspective, read the next section. If you're not, skip on ahead (or don't, I don't mind). If you're new to Chrome OS, you may currently be wondering just how a browser can justify a $1000 laptop. You may also not be surprised to learn that a great number of workflows still aren't going to play nicely with Chrome OS. If you need the Adobe suite, certain parts of the Microsoft suite, professional audio, video, or photo editing capabilities, or just about anything that requires you to install an application on Windows or Mac OS to do, you're likely going to find functional gaps in Chrome OS. I understand that a great many people need their laptop to do X Thing, and I'm right there with you. Chrome OS's lack of robust image editing and management capabilities makes it a non-starter for me as an OS for doing my job at this point. That's a bummer. However, if you're looking for a laptop more for personal use and less for dedicated, specialized tasks, you're probably curious about just how mature Chrome OS is as an operating system, and what limitations you may encounter that you wouldn't on Windows or Mac OS (or even Linux). The first thing I'd ask is just how many of your typical computing tasks could be moved to a browser if you really gave it a try. For me, I've found that - outside of work - the answer has actually been essentially all of them. Music? Google Play Music has a web app (so do Spotify, Pandora, and many others). Cloud storage? You can use the native Drive integration, or once again, a web interface (I use Dropbox). Media? Netflix, Hulu, YouTube - all these work in the browser, of course. Personal media libraries can easily and seamlessly be handled with services like Plex, which offer web apps. I can even send SMS messages from my Chromebook by using the Pulse SMS web interface, along with messaging services that offer web apps like Facebook, WhatsApp, and Hangouts. When you really sit down and think about it, the number of services and products that work just fine in a browser is surprisingly large. You can even run Microsoft Office in the web with Office 365 now, not to mention Google's own document, spreadsheet, and presentation products. The next step is going to be extensions. If you're a Chrome user, you're probably already familiar. Chrome extensions can make your browser a lot more powerful provided you get value from them, which isn't always necessarily a given. But there are tons of great extensions out there - everything from password managers to chat apps to calendars to feed readers. I'm not a huge extension user, but they're a big part of the Chrome ecosystem, and they're absolutely worth exploring. The final piece, I'd argue, is the most recent: Android apps. Android apps on Chrome OS have come a long way pretty quickly. 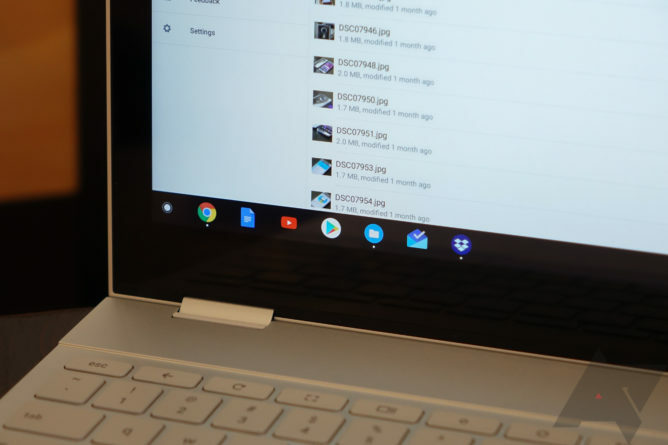 From initially being rather buggy with limited support, many apps now scale and resize reasonably well on Chrome OS with Nougat's freeform mode, and with more and more Chromebooks featuring touchscreens, are increasingly practical to interact with. Now, are many of these going to also have redundant web or extension access points available to you already? Yes. But, that's not going to be true of every app, and perhaps some services that do offer those things may not feature the same functionality you get in an app. For example, Android apps on Chrome OS can push notifications even when they're not running - compare that to the browser: obviously you won't get Gmail notifications if you don't have a Gmail tab open in Chrome (well, you could use an extension). But if you have the app installed, you will. This fills what, in my mind, has been a major gap in the Chrome operating system, and brings it closer to parity with Android in terms of notification functions and general persistence. I doubt it helps with battery life, though. Between all of these things, I think most people will find Chrome OS is actually 95% of the operating system they actually need day to day for personal computing, if not more. There really isn't a lot that we do these days in terms of casual computing tasks that requires dedicated applications or extremely powerful hardware. Still, I recognize that it can be the one thing you can't do with a computer that can take it out of consideration - and with Chrome OS, you may occasionally have to get creative to solve these problems. In some cases, that may even mean using a remote desktop app to log in to a computer that does the thing you need to do. It's not exactly elegant, but it works. For me, adapting to Chrome OS hasn't been difficult. I used a Chromebook Flip for a while, but it was so agonizingly slow that the very idea of actually doing work on it was deeply unappealing. It also had a really small display and a cramped keyboard. With much more powerful hardware and a proper keyboard, though, getting work done on the Pixelbook has been surprisingly pleasant. Even more so than my Windows laptop, actually - aside from image management and editing. That's where Chrome OS still falls down for me, and if you're in the same boat thinking that maybe you could get by with the Android versions of Lightroom and Photoshop, I'd tell you not to get your hopes up. They're not nearly as capable as their desktop counterparts - Adobe has a long way to go before I'd call these Android apps anything but a cheap knockoff of the applications they share a name with. 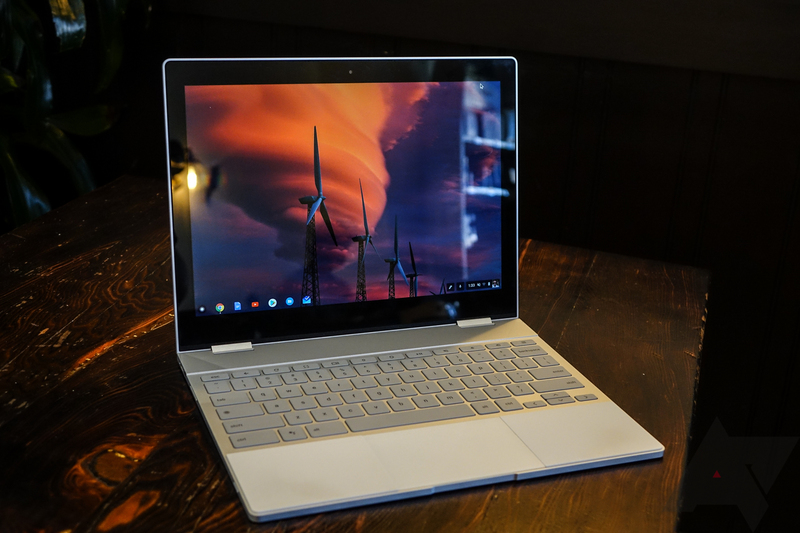 But I'm writing this review of the Pixelbook on the Pixelbook, and once I process my photos for the review in Lightroom on my Windows laptop and get them up on Dropbox, I'll finish the review on the Pixelbook, too. Chrome OS's interface has seen significant evolution over the years, but nothing is dramatically different. You've got handy keyboard shortcuts for an "expose" UI to manage your windows, native screenshot support, a full-screen mode key, quick controls on the bottom right, and dedicated keys for back and refresh. The Pixelbook adds a dedicated key to launch the Google Assistant, something I've found little occasion to actually use on the laptop. The dedicated key launches the Assistant in typed input mode. In order to speak to the Assistant, you have to either press the microphone button after hitting the Assistant key or launch it via the 'OK Google' hotword. I think it would also make sense to trigger listening via a long-press of the Assistant key, personally. The Assistant does most of what you'd expect - just think of it like the Assistant on your phone. It does basically all the same stuff, even timers and reminders. 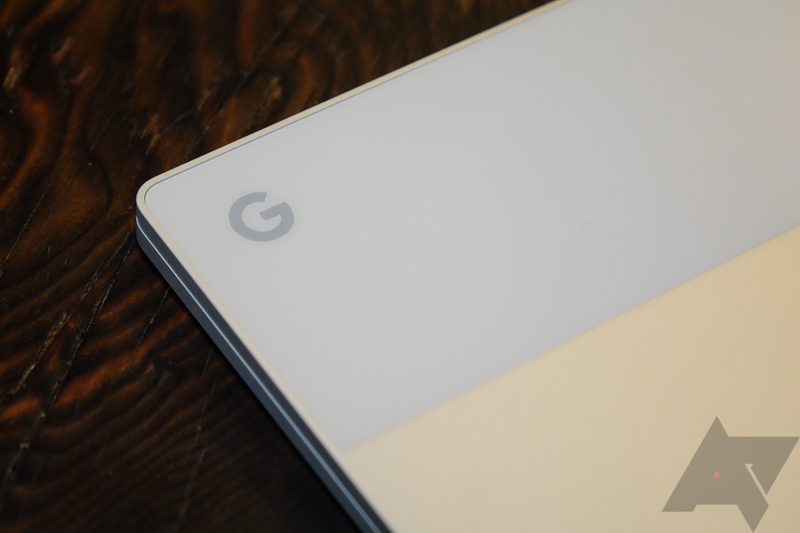 One sore spot for Chrome OS and the Pixelbook is biometrics. The Pixelbook doesn't have a fingerprint scanner or any face recognition technology built in. This seems very silly for a $1000 laptop in 2017. Having to type a PIN or password every time I want unlock my computer is very last-decade, and I really expected more from Google on this front. The Pixelbook does have the same beta Smart Lock feature every other Chromebook does, which sends a notification to your connected Android phone to unlock your laptop (the logic being that if you can unlock your phone, it's OK to unlock your laptop). It's janky and doesn't work reliably. Even if it did, it's no faster or more convenient than just typing a PIN. Google really needs to get it together here; I'm honestly baffled that the Pixelbook doesn't offer face recognition. Google also talked up its new Instant Tethering feature at the Pixelbook launch, but it's not live in time for our review. When it is, your laptop should be able to find your nearby Android phone and tell you it can instantly enable tethering for internet access (if no known Wi-Fi is available). That'll be handy... when it's available. Does the Pixelbook earn its $1000 price tag? On hardware, I think I can say "yes" without many reservations. The speakers could be better and I think the display bezels could have been shrunken to accommodate a larger panel. The lack of a fingerprint scanner or other biometrics is disappointing. And two USB-C ports and one 3.5mm jack offer fairly measly, dongle-heavy connectivity. But, you do get a laptop with stellar battery life, a very good display, excellent keyboard, elegant design, and robust if slightly impractical tablet capabilities. It almost goes without saying that this is the nicest Chromebook you can buy, because how could it not be? The value question hinges far more on the software, something that will come down to personal needs. If Chrome OS offers everything you need in a laptop, the Pixelbook seems like a pretty fair proposition. This is a Serious Chromebook for the Serious Chromebook User. The thing is, I just don't think many of these people exist (I know some of you are out there). If you're like me and do find that you still have need for desktop-grade applications on a fairly regular basis, Chrome OS remains a non-starter. That's unfortunate. But Chrome OS has reached a level of polish and flexibility (especially with Android apps) that I could scarcely have imagined seven years ago. There has been no better time in Chrome OS's history to launch a $1000 Chromebook, because this is the best Chrome OS has ever been. Is that good enough to drop a grand on a Google laptop? That's going to be your call. 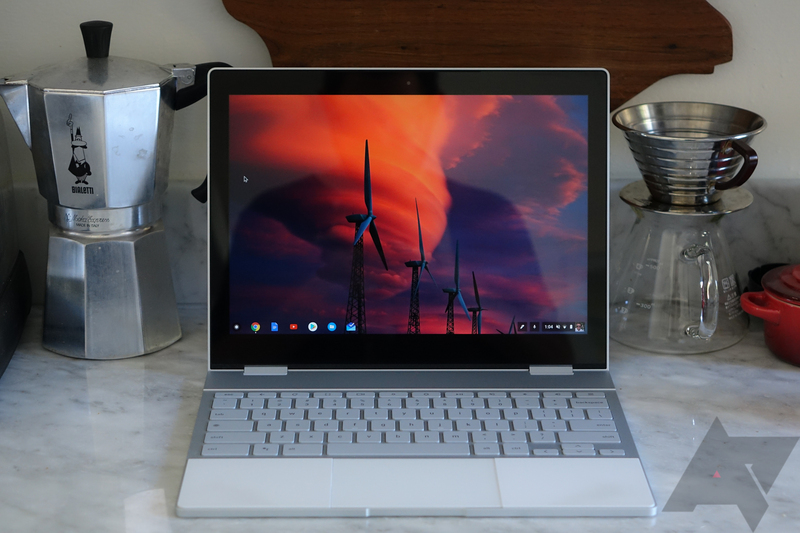 For the Chrome OS fans out there itching for a new premium Chromebook that they can proudly whip out at the local cafe, the Pixelbook is a win. If you already know Chrome OS does what you need (or, alternatively, that you can live with the ways it doesn't) and you want The Best Damn Chromebook Money Can Buy, the Pixelbook is a no-brainer. I'd contend the only option really worth considering is the 128GB base model - just manage your storage carefully and use the cloud. I don't think the $200 price bump for the 256GB version is worth it (let alone $650 for the i7, 16GB RAM, 512GB NVMe trim). Spend the extra $200 on dongles and a nice bag to put it in. You might be wondering, then, what I meant by the title of this post. I do think Chrome OS needs a real premium laptop to be taken seriously alongside Windows and Mac OS, and I think the Pixelbook is that laptop. 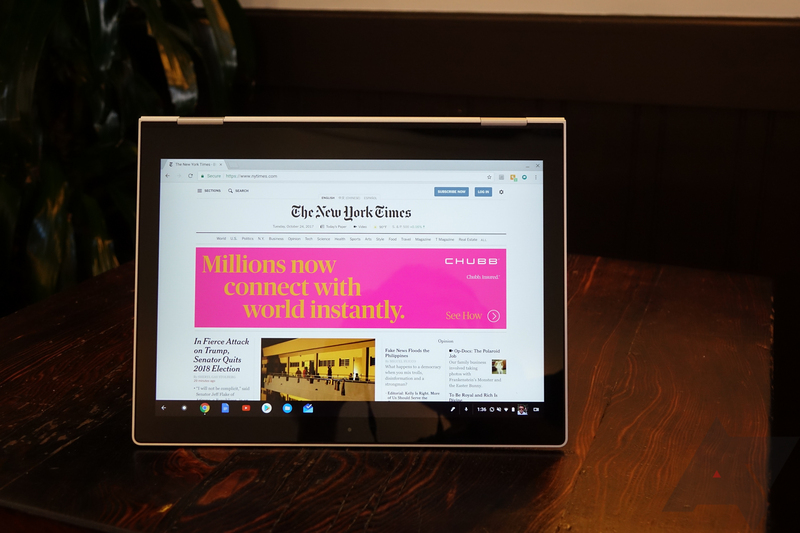 It acknowledges and plays to Chrome's strength in touchscreen support (Android apps in particular), and it brings a pretty proper high-end laptop experience to a platform that sorely lacks one. But does Chrome OS warrant a $1000 laptop, apart from catering to a small group of dedicated individuals that have committed themselves to it? I have to come down on the side of "probably not, but we're getting there." I can't see myself recommending the Pixelbook to friends or relatives when plenty of perfectly serviceable and much cheaper Chromebook options are out there. People keep laptops a longer time than phones, generally, and with Chrome OS changing and evolving quite rapidly, a $1000 investment in the platform for your ordinary consumer seems inadvisable. 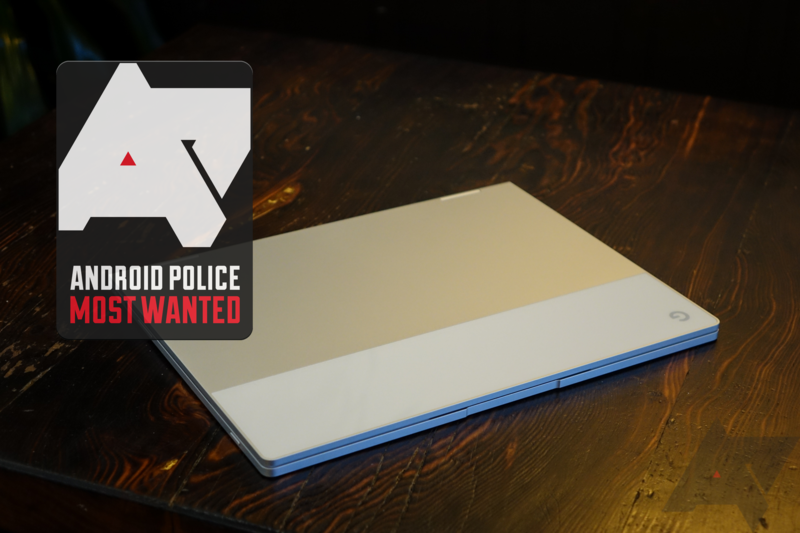 Far better to be leapfrogged by some new feature (*cough* biometrics *cough*) and have $500 in your pocket than to be out that extra money for the sake of a "nicer" laptop. The hard truth is that while maybe the Pixelbook types nicer, runs faster, and looks better than many other Chromebooks, it doesn't really do anything they don't. And it's not like you're paying more for the hardware horsepower so you can do something like video editing in Adobe Premiere, because that's not something anyone's doing on a Chromebook, because the software doesn't exist. But, if you're invested in the Chrome ecosystem and just want a really nice Chromebook? Google built a really nice Chromebook. I'm giving the Pixelbook our "Most Wanted" editor's choice award, because it is unquestionably the best Chromebook on the market. I kind of doubt Google will sell many of them, though. USB Type-C is a terrific new technology. Having the same charging port on your phone and laptop is pretty awesome. What isn't awesome is having to replace all your cables. USB-C to USB-A cables are spendy enough, but more specialized cables like USB-C to HDMI adapters can be downright ridiculous. The one Google sells on its storefront is 50 freaking dollars. No worries though, there's another way to get great USB-C to HDMI accessories for far less. Our friends at Choetech sell their adapter and cable for less than half the price. Both are highly rated and include an 18-month warranty, so you don't need to worry about skimping on quality either. As an AP reader, you can grab one, or both, at an even better price with our exclusive coupon codes. This is a paid promotion brought to you by Choetech, the sponsor of the PixelBook review on Android Police.